I think this Clumber has ectropion. It comes from The Illustrated Book of the Dog (1881) by Vero Shaw and Gordon Stables. The Sussex spaniel is pretty moderate looking compared to the modern version, but the Clumber very much looks like it has ectropion. This trait has likely existed in this dog ever since they were show dogs. Indeed, there were always likely a few dogs with the condition, even in working kennels. Does that mean that this trait should be lauded in the breed? This is a health condition, not a fancy point that should be rewarded in the ring. Lots of dogs have historically had conformation issues that are bad for their health and welfare. 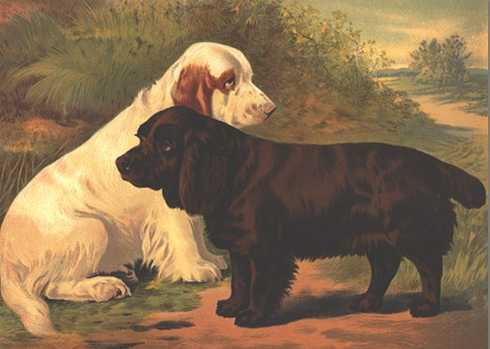 Field spaniels were bred to have such short legs and long backs that they were often crippled by herniated spinal discs. Herniation of the spinal discs is much more likely in dogs with this conformation, and as a result, the field spaniel became quite rare. Today, the field spaniel is bred with longer legs and a more proportional back. It has fewer problems with its body. It’s still not very common, but these days, no one is going out of the way to breed field spaniels with dinky little legs and a long back. That’s what has to happen with Clumber spaniel eyelids. If not, this breed will become nothing more than a giant version of the Cavalier King Charles spaniel. A spaniel, yes, but one that might not be considered a true sporting spaniel anymore. Dumb question. Why is everyone so worried about ectropian? A couple of the dogs I grew up with had droopy lower eyelids and showed red . . . it never seemed to cause them problems. Ok, it’s be better not to have something that looks like it’s inflamed, and the risk of conjunctivitis is increased. Floppy ears tend to lead to ear infections. Should I be trying to breed prick-eared Labradors? Seems to me there are a lot worse health hazards in dog breeding. If you had this issue, you would be in great discomfort. People get it and it’s not fun. You can’t keep debris out of your eyes. Dogs are a lot tougher than people so they usually don’t make much fuss about it.